Chinese export sterling silver dresser box with allover bamboo decorations on a hammered background with a gilt interior by Tuck Chang and Company of Shanghai, China, c.1880. This truly elegant box has a push on lid that fits properly with an ornate, period monogram in the central reserve: ASR. Weighing 175 grams or 5.6 ozs. 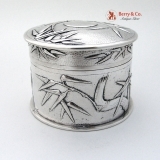 Troy, this handsome and useful box is 3 1/4" in diameter and 2 3/8" tall. Monogrammed as described above, the soft, warm, original finish is present, with no buffing or machine polishing. The excellent original condition and clear detail, with no removals, repairs or alterations, make this an especially attractive offering.